Betty Rosbottom spent her formative years in areas known for their food. In her childhood home of Memphis, Tenn., she enjoyed that city’s signature barbecue. She attended college in New Orleans, where she learned to love Cajun and Creole dishes. She spent her junior year at the Sorbonne savoring French cuisine. Once she started cooking, she never stopped. 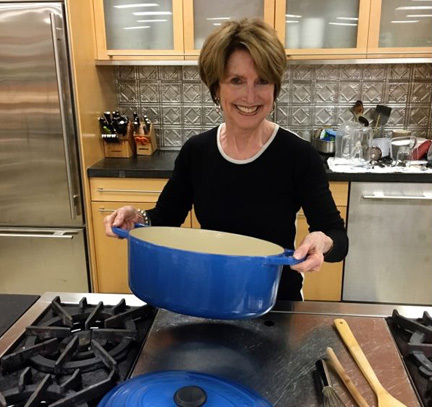 She founded a cooking school in Columbus, Ohio, in the late 1970s and learned from guest teachers like gourmet legend Jacques Pepin and “queen of cake” Maida Heatter. 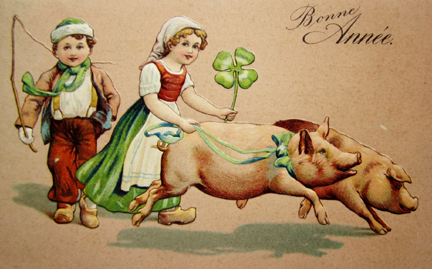 Eventually, she attended the Parisian cooking school La Varenne. Betty has written a syndicated food column, hosted a PBS food show, taught cooking in many venues, and written 11 cookbooks. 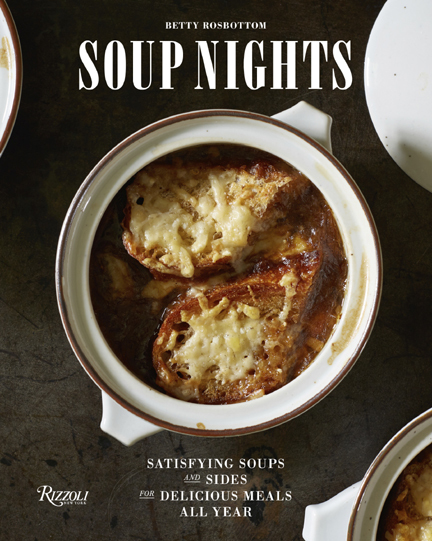 The most recent of those books is Soup Nights, published just in time for National Soup Month (January) by Rizzoli. I asked Betty about her earliest happy recollection of soup. Ironically, she told me, her first beloved soup—French Onion Soup Gratiné—graces the front cover of “Soup Nights.” She fell in love with this classic French favorite at les Halles, Paris’s big central market, during her junior year abroad. Les Halles has since closed; I am lucky enough to have visited the market and tasted that ambrosial soup as a small child. I asked Betty to walk me through the process of creating one of the recipes in Soup Nights. She explained the thinking behind her Winter Tomato & Garlic Soup, which uses ingredients she tends to have in her cupboard—canned tomatoes, chicken stock, onion, garlic. “I love tomato soup,” she enthused. “As a child I the only tomato soup I ever had was the one that came in the red-and-white Campbell’s can. It was a revelation to me that you can make tomato soup. 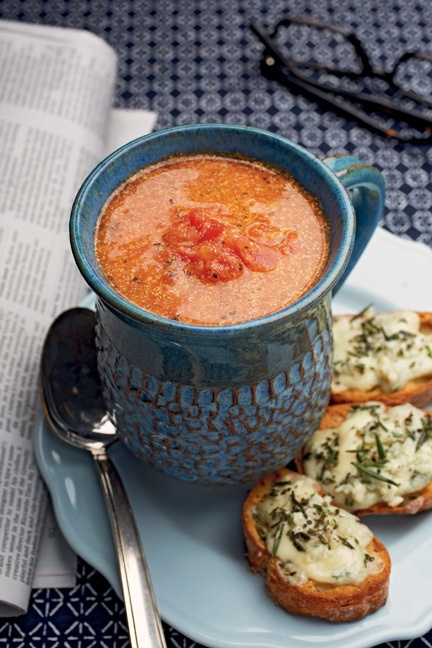 Eager to help readers figure out what to serve with their soup (her book features sandwiches, salads, and desserts as well as straight soups), Betty Rosbottom suggests pairing the tomato soup with Gorgonzola bruschette. Betty Rosbottom wasn’t at liberty to tell me what her next project will be, but she predicted that it will be “very popular.” She lives in Amherst, Massachusetts, but she is spending January in her favorite city in the world, Paris, doing culinary research. In fact, when we spoke she was in her Paris apartment. The long distance connection made me happy if just a little jealous. During our conversation I could almost smell the onion soup! © Soup Nights by Betty Rosbottom, Rizzoli New York, 2016. Used with permission. Set the stock in a pot over very low heat; then cover it. Keep the stock warm at a very low simmer while you prepare the soup. In a 5-quart heavy pot (with a lid) over medium-low heat, heat the butter and oil. When hot, add the onions. Cover and cook, stirring frequently, 15 minutes. Remove the lid, and raise the heat to medium. Stir in 1 teaspoon salt, the sugar, and the flour. Cook, stirring constantly, scraping the bottom of the pan so that the flour does not burn, until the onions are rich golden (like the color of light brown sugar), 35 to 40 minutes or more. When the onions are done, add the simmering stock and 1/2 cup of the wine. Season the soup with salt and pepper, and a pinch or two of extra sugar if desired. Simmer, partially covered with the lid set ajar, 40 minutes more. While the soup is simmering, prepare the baguette slices and the cheese topping. Arrange a rack at center position of the oven and preheat to 350 degrees. Brush the baguette slices generously on both sides with olive oil and arrange on a rimmed baking sheet. Bake until the slices are crisp, 4 to 5 minutes per side. Remove and cool. (The baguette slices can be prepared two days ahead; store in an airtight container at room temperature.) Retain oven temperature. Arrange 6 ovenproof soup bowls or ramekins on a rimmed baking sheet and fill them 3/4 full with the hot soup. Divide the slivered cheese among the bowls. Float 2 to 3 baguette slices on top of each serving, and sprinkle generously with some grated cheese. Depending on the size of your bowls or ramekins, you may have some soup, cheese, or croutons left over. Bake the soups until the cheese has melted and is lightly browned, 15 minutes. Watch constantly. If desired, run under a hot broiler to brown more, 1 to 2 minutes. Serves 6. In a heavy, 4-quart saucepan over medium heat, heat the oil until hot. Add the onions and stir until they start to soften, 3 to 4 minutes. Add the garlic and stir for 1 minute more. Add tomatoes, 3-1/2 cups broth, basil, red pepper flakes, 1/4 teaspoon salt, and sugar. Stir well to combine and bring mixture to a simmer. Reduce heat to low and continue to simmer until vegetables are tender, about 20 minutes. Ladle the soup into bowls. 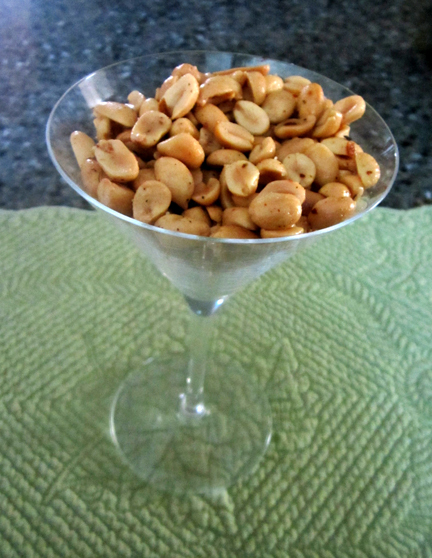 Serve with the Gorgonzola Bruschette alongside or, if you prefer, float one on top of each serving. Serves 6. Arrange a rack at center position and preheat the oven to 350°F. Have a foil-lined baking sheet ready. Spread each slice with Gorgonzola; then return to the oven until cheese has melted, 3 to 4 minutes. Sprinkle each slice with chopped rosemary. © Harry Zernike. Used with permission.